These Thigh High Compression Socks by Truform have a sheer, elegant design that gives you the confidence to wear them anywhere. In addition to looking and feeling great, these Women's Compression Stockings deliver all the health benefits you should expect from a Compression Therapy Garment. Truform Women's Compression Stockings benefit from durable construction and comfortable wear, thanks to their special blend of 88 percent nylon and 12 percent spandex. This stocking's sheer style gives them the look of non-medical pantyhose, so they'll go great with any semi-casual, professional or dress wardrobe. 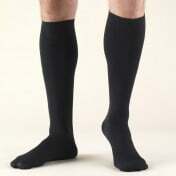 This Women's Thigh High 8-15 mmHg Circulation Sock offers mild compression therapy in the 8-15 mmHg pressure range. This pressure range is recommended to treat mild symptoms related to circulation disorders, symptoms such as leg pain and swelling. Mild compression therapy is also recommended to improve leg health for individuals who spend long periods of time sitting or standing. The stay-up top bands at the top of these Support Stockings help them comfortably stay in place during all-day wear, and their beautiful lace design offers attractiveness in addition to their functionality. Color options include black, and beige. Truform Thigh High Stockings are made in the USA. Find the pair that's right for you today, and start energizing those legs with circulation support.